Enhance your worship area with one of these solid wood offering pieces. Attractive oak finish will coordinate with any room in your church. 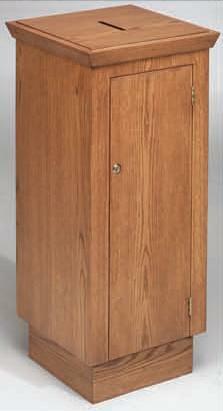 Choose from Tithe Box with Pedestal Base or Stand Mounted in addition to the Offering Table. This beautiful furniture is finely crafted from the highest quality red oak hardwoods and oak veneers. Offered in three wood finishes and protected by a 3-step lacquer process.